A commanding lead by Croatia's Sime Fantel/Igor Marenic has rewarded them with victory ahead of the Medal Race at ISAF Sailing World Cup Hyeres. The Croatian pair has also secured ther place on the Abu Dhabi Final start line and a share of the €72,000 prize fund. There have been some intense battles for the top spot in the Women's 470. Race wins have been spread across the fleet resulting in some big movements on the leader board. Six points separate first to fourth so it'll go down to the wire on Medal Race day. A 4-7 score line ensures Fernanda Oliveira and Ana Barbachan (BRA) hang on to the leading position for two days running. Hannah Mills and Saskia Clark (GBR) had an impressive day on the water, gaining a second and bullet in the light conditions. 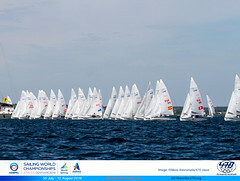 The pair will enter the Medal Race in second place, just two points behind the leaders. Jo Aleh and Polly Powrie (NZL) piled on some pressure with a bullet and a third. As a result they sit in fourth, one point off Camille Lecointre and Hélène Defrance (FRA). In contrast, the Men's 470 leader board is a little more set ahead of Sunday's Medal Race. Sime Fantela and Igor Marenic (CRO) built on their lead posting a sixth and a bullet. 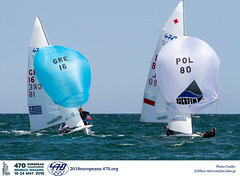 They ended the day an 25 points clear of Luke Patience and Elliot Willis (GBR) to claim the gold medal and a share of the €72,000 prize money with only the Medal Race remaining. After arriving ashore Marenic chirped, "We are thrilled with how our week went. We sailed really consistently so we are super happy we won before the Medal Race." Even though the Croatians have gold sealed they won't be taking it easy on the final day, "We sail every Medal Race with a sharp mind and we will always try to do our best so that is what we plan to do tomorrow." However, the story is still not over for the rest of the fleet. 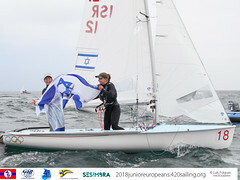 Patience and Willis, sit on 51 points in second, with Mat Belcher and Will Ryan (GBR) and Ferdinand Gerz and Oliver Szymanski (GER) hot on their heels. Things were looking hopeful at the start of day for Matthias Schmid and Florian Reichstädter (AUT) who were straight out of the traps, claiming the first race win of the day moving them higher up the leader board. After claiming 21st place in the second race they were left 19th overall, missing out on a place in Sunday's Medal Race. With only a few points between the top five teams at the top of the leader board, sailors will need to bring everything they have for the Medal Race if they want to join the Croatian sailors on the podium. The 470 Men Medal Race is scheduled for 1320 hours and the 470 Women Medal Race at 1345 hours. Get involved with the Live Medal Races by sending in your questions for the sailors and the commentators by using the #LiveSailing hashtag and mentioning @ISAFupdates. 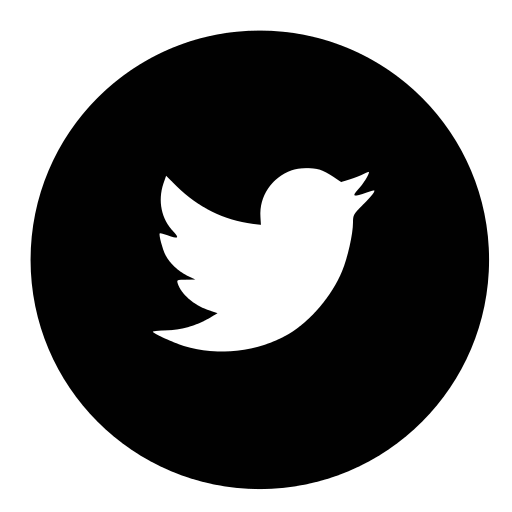 Video - Daily 3 minute agency news feed. Includes long lens shots, on board action, mounted cameras, commentary and sound on tape. N.B. All interviews are in English and mother tongue. Live Tracking - will be available to watch in 2D and 3D via the live tracking. Click here to view live tracking. Twitter - the @ISAFupdates and @FFVoileEvt Twitter accounts will be following the action throughout the week.